Small town convenience at small town prices. 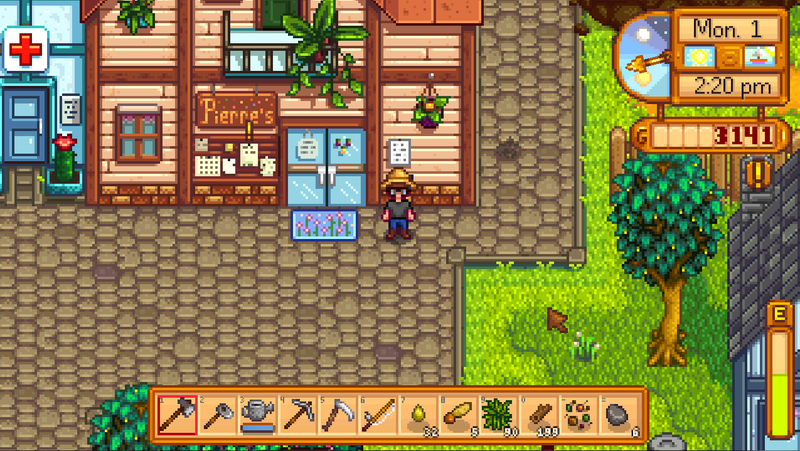 Pierre’s General Store is one of the hubs of Stardew Valley’s Pelican Town, and you’ll quickly become familiar with the place for one important reason: it’s the local shop. This is where you come to purchase Seeds for planting new crops, among other things, and given that crops wither away between seasons you’ll be making at least a few trips to Pierre’s every month. It’s also a popular place for the locals to visit, so you can expect to see many of the NPCs milling in and out of Pierre’s during business hours. Pierre's stock varies from one season to the next, and the majority of the items that will change are Seeds. He only sells Seeds that will grow during your current season. Consequently, it's wise to plan your purchases according to the current date. Buy new Seeds as early as you can, and don't purchase more if they won't mature before the beginning of the next season. You can waste an awful lot of money by neglecting your calendar. There are no season-specific items listed for Winter below, as (most) Seeds do not grow in the snow. Don't expect to visit Pierre's General Store nearly as often during this quarter of the year. Note, too, that Pierre's selection grows from one year to the next, and you'll find more advanced Seeds in subsequent years. Pierre’s is open from 9 am to 6 pm on every day except Wednesday. Pierre seems to go on occasional breaks, however, so you’re advised to come here for 9 am to guarantee he’ll be around. If he’s not in, or if you need items beyond his shop hours, you can get many of the same items at Joja Mart - but they’ll cost more. In addition to the above purchases you can also upgrade your Backpack at Pierre’s shop and unlock more slots for storing items. Unlike other items, these upgrades are available via the counter to Pierre’s right.